Synovial chondromatosis is a benign nodular cartilaginous proliferation that mainly occurs in large joints. The temporomandibular joint is considered to be rarely affected. Several cases of synovial chondromatosis of the temporomandibular joint have been reported with clinical and histological features. People with this disease may present with swelling, pain, intracapsular sounds, and limitation of mandibular movement. Radiographs are an important component in the diagnostic process for synovial chondromatosis. In this article, we report three cases of synovial chondromatosis occurring in the temporomandibular joint with a focus on the radiological features, including those on plain films, cone-beam computed tomography (CT) images, and conventional CT images. The three cases had totally different radiological features. The imaging differences were analyzed and compared to create combined diagnostic methods based on clinical features and examination techniques. 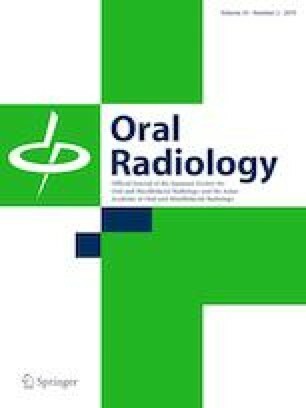 The role of cone-beam CT examination in the diagnosis of the disease is discussed. Bei Tang, Kaili Wang, Hu Wang, and Guangning Zheng declare that they have no conflict of interest.